With collaboration of Dr. Bonita Stanton, Drs. 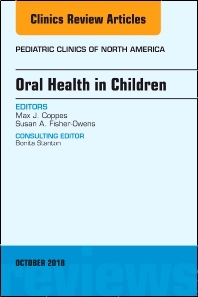 Coppes and Fisher-Owens have created a current issue that looks at oral health in children, with a much needed update in the literature for pediatricians. Top experts have contributed clinical reviews on the following topics: Oral Health and Development; Infant Oral Health and the Influence of Habits; Prevention of tooth decay; Fluoride; Caries; Disparities in Children’s Oral Health (including Oral Health of Native Children); Children with Special Health Care Needs; Orthodontics; Oral Manifestations of Systemic Disease (specific to pediatrics and life course); Soft Tissue; Trauma; The Role of Primary Care Physicians (pediatricians and others) in Prevention Oral Disease; and Oral Health Care/Policies. Pediatricians will come away with the current clinical recommendations they need to improve oral health in children.